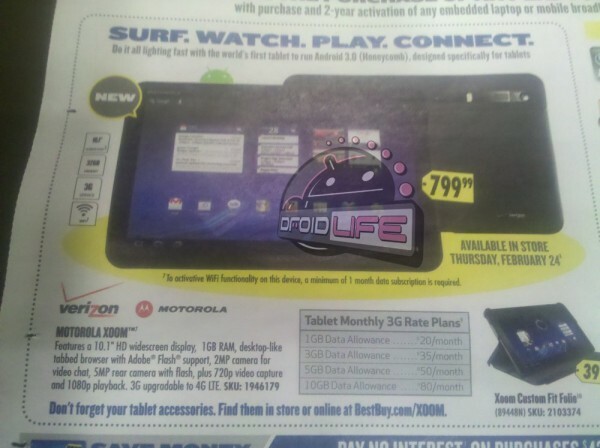 In next Sunday’s Best Buy ad (February 20th), we already found out that the HTC Thunderbolt would be $249 on 2-year contract and $749 at full retail, but what about the Motorola XOOM? We had seen a price of $799 a couple of weeks back and also heard that a 1-month data subscription would be required to unlock WiFi on the device. Well peeps, we’ve confirmed both of those. The price is indeed $799 at BBY and you’ll have to grab at a data plan for the first month in order to unlock WiFi. We’re assuming that you can cancel immediately after and enjoy the device with just WiFi, but you’ll shell out an extra $20 on day 1. Oh, and Best Buy definitely expects to sell it on the 24th. Note: So that everyone is clear, this is the ad that comes out on the 20th. You won’t see it in tomorrow’s newspaper.